Filled with lies, deceit, and betrayal, “A Doll’s House” is a dramatic performance that shows the crazy things that love and money can make you do. Starting off with a seemingly innocent Christmas Eve scene, the story takes a quick dramatic turn when the leading character, Nora, is blackmailed for her biggest secret. Don't miss A Doll's House Part 2 at Orlando Shakespeare Theater, showing Jan. 2 - Feb. 3. Save $10 when you see both shows! Enjoy a double feature on Saturday, Jan. 26 with an artists panel and buffet. Go to DollsHousePlay.com for details and a promo code to save $10. 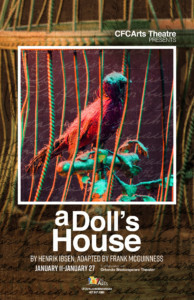 Go to DollsHousePlay.com to find out about a promo code for $5 off!